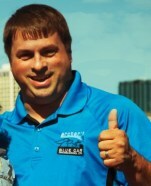 Dominic (Dom) is a Co-Owner of Archer’s Driving School as well as Archer’s Senior Instructor. He instructs in one of our new blue Kia Souls. His teaching schedule is posted on our online booking calendar, and includes a mix of daytime, evenings, and weekends. Dom has been a licensed Alberta Class 5 driving instructor (for in-car plus classroom) since 2013. He also has significant additional instructional experience during a 20-year Canadian military career (now retired). During his time in the military he instructed soldiers on driving military vehicles ranging from regular vehicles to tracked armoured personnel carriers. Born in Montreal, Dom was raised and educated in a French environment. After joining the Army he was put by mistake on an English Basic Combat Engineer’s course and then posted in a Anglophone Regiment ever since. After spending over 20 years out west, Dom is now fluent in English and has obtained the highest level of bilingualism rating for employees of the Government of Canada. While Archer’s classroom instruction is in English only, Dominic can provide French language assistance for classroom sessions that he instructs (Dom and Kelly alternate classroom instructing), and can provide primary French language instruction for in-vehicle lessons on request. Kelly is a Co-Owner of Archer’s Driving School, as well as a part-time instructor, with availability on certain evenings and weekends. 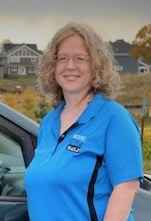 She mostly instructs in either one of our new cars or sometimes in our original blue Kia Rondo. Kelly has been a licensed Alberta Class 5 driving instructor since 2008 (licensed classroom instructor since 2007). Both Kelly and Dom have attended NAIT’s BMI courses (Becoming a Master Instructor). NAIT’s BMI program is a ‘train-the-trainer’ curriculum that helps knowledge experts in various fields develop a teaching practice and provides important strategies and skills to apply in teaching adult learners. Being a farm girl from Manitoba, Kelly has had her license since she was 16. She was also riding dirt bikes and farm trucks even earlier than that! Kelly thinks that Graduated Driver Licensing is a great thing. Waaaayyyy back then, when there was no such thing as a GDL system, she learned things the Hard Way. On more than one occasion she had to walk back home and get her Dad to pull her car out of the ditch! Carol is a licensed Alberta driving instructor, and an independent contractor-instructor with Archer’s. Her training car is a silver 2012 Honda Civic – don’t worry, it has an Archer’s blue attitude on the inside! Carol’s teaching schedule is mainly Monday to Friday daytimes, with occasional early evenings. 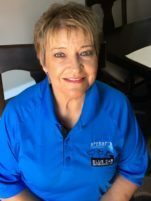 With an impressive amount of driving instructor experience, Carol has been in the Alberta driver training industry for over 25 years, including a period of time as an Alberta Driving Examiner! She always has great advice to give her students during their lessons.